Blendy's NZ Yarn Sampler Box: Felt....like fudge! The NZ Yarn Sampler Box is sold primarily at felt.co.nz, and many of the suppliers you will find in the box also sell their products in their own Felt store. If you are a crafter, you will know how great this website is! If you are someone who likes to buy amazing and unique hand crafted creations, then you need to check it out right now. Felt is your online outlet dedicated to all things handmade. Whether you're shopping for quality handcrafted goods or looking to sell your creations, this is the place for you. Register now – it's fast, easy and free! 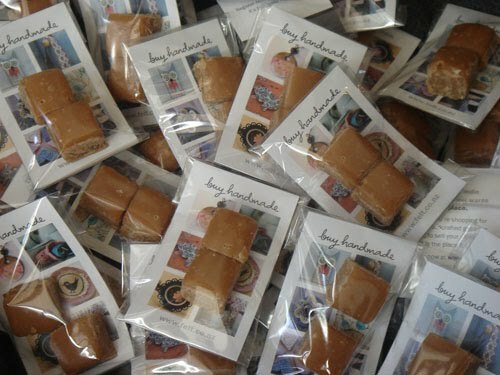 Lucy at Felt has sent in a whole box load of yummy fudge, because as we all know, sugary treats + craft = AWESOME!! Thanks Lucy! Register for the sale date!